At 4 p.m. ET (2000 GMT), the Canadian dollar was trading 0.3 percent higher at C$1.3062 to the greenback, or 76.56 U.S. cents. The currency's strongest level of the session was C$1.3046, while it touched its weakest since June 28 at C$1.3124. 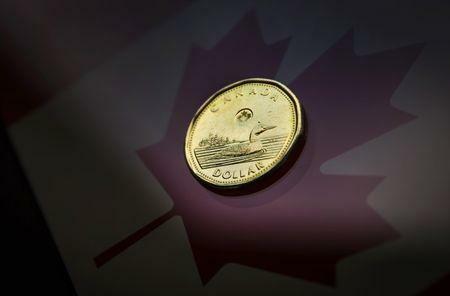 "It really feels like a little bit of a pause here (in the loonie's decline) ahead of the FOMC," said Brad Schruder, director of corporate sales and structuring at BMO Capital Markets. "I'm not sure the market is buying expectations for rate hikes from the Bank of Canada for 2018." Chances of a rate hike by May have slipped to less than 60 percent from around 75 percent earlier this month, data from the overnight index swaps market shows. The U.S. dollar <.DXY> fell against a basket of major currencies after four straight weeks of gains as a Reuters report, that European Central Bank officials were shifting their debate from bond purchases to the expected path of interest rates, boosted the euro. U.S. President Donald Trump appears to be "enthusiastic" about coming to an agreement on renegotiating the North American Free Trade Agreement (NAFTA), Canada's Prime Minister Justin Trudeau said. The price of oil, one of Canada's major exports, slipped as Wall Street slid and energy market investors remained wary of growing crude supply. U.S. crude oil futures settled 0.5 percent lower at $62.06 a barrel. Canadian government bond prices were lower across the yield curve, with the two-year down 3.5 Canadian cents to yield 1.783 percent and the 10-year falling 24 Canadian cents to yield 2.166 percent.